While the media on which audio is recorded have changed over time, the signal recorded on them has not, other than maybe some degradation brought on by use, and dust, and time. All that’s required to get that signal onto your computer is the original device (a record player, ie. ), a sound card (or audio ins and outs built onto the motherboard of the computer), and perhaps an intermediary device of some kind. Take old wax cylinders, for example. If somehow you’ve got an ancient device that plays these things, perhaps with a horn for amplification, set it going and record it with a mic plugged into the computer. No, really, it can be that simple. In fact, this little trick can actually be applied to live musicians, allowing you to record a whole song without multitracking or anything else, and all in one pass! Low tech can be pretty amazing at times. Wax cylinders may not be that common anymore, but a lot of “vinyl” is still around; 33 1/3, 45s, and even 78s. Check out the quantity available in ebay’s record section (151,436 items at time of writing). But when buying turntables or vinyl from ebay sellers, be extra careful. If you’re lucky you’ll find a reputable seller, but Joe Shmo just trying to unload some old discs may send them out in a padded envelope without any protection against bending. As for old turntables, I received one shipped in the original box. Unfortunately boxes really don’t retain their full structural integrity after a few decades of sitting in the garage or wherever. The scenario is basically the same as for the wax cylinder above, except that there are two approaches with regard to the intermediary device. We can omit it altogether and use an rca to stereo mini-cable plus adapters to plug directly into the computer mic input and record from there, or we can connect to a phono preamp and connect it to the line-in on the computer. The signal recorded on vinyl is weak in the bass in order to keep the needle from otherwise being bounced from the groove. Also the the cartridge on the tonearm containing the needle produces a very weak signal, not unlike a microphone. Microphone inputs boost the incoming signal, which is why if we were going direct, we would plug in there (though potentially problematic if your recording is stereo and the mic input is mono). Back in the day we had a thing called the “home stereo,” the heart of which was the “receiver.” It typically contained the amplifier and a radio, as well as inputs for tape deck and phono (the record player). The phono input not only added additional amplification, but it also boosted the bass to compensate for its weakness. If you have one of these antiques and it has a line-out, you could plug your turntable into it, and then connect its line-out to the line-in of the computer and record from there. Otherwise you will need a stand alone phono-preamp (costing from $40 to thousands of dollars in the crazy world of audiophiles), or alternatively you can fix the recording in software afterwards. Whichever approach you use, you will need some sort of audio recording program. On Linux, I use Audacity, which is also available for Mac and Windows. There also used to be a splendid little program for Windows called CoolEdit, but it was bought by Adobe and turned into Adobe Audition (and a little bird tells me that Adobe Audition does not run as well as CoolEdit on older or virtual machines). One could probably find CoolEdit still on thepiratebay.org, but that would be copyright infringement, and Adobe wouldn’t like it, even though they wouldn’t sell you CoolEdit no matter how much you were willing to pay. Audacity contains equalization presets not only for 45s and 33 1/3 (the RIAA preset), but also for several varieties of 78, as each company in the old days had their own standard. If one was a perfectionist, even if one had a phono preamp, one might choose to do 78s direct to the mic input and apply the eq after the fact, exactly according to the standards of the company that made the 78 being recorded. source -> possible intermediary device like mic or phono preamp -> computer input (line-in or mic-in depending on the level of the signal coming in). Everything old can be new again. 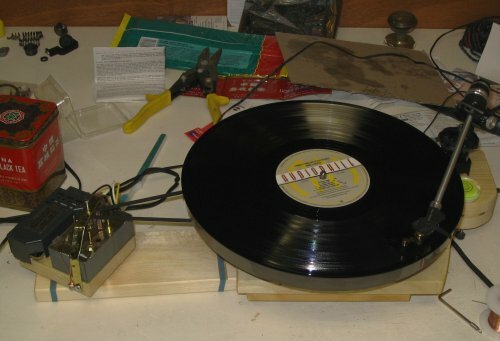 If you get seriously infected, you might even try building your own turntable. Naw, that would just be crazy.